Frozen Lunch Review: Lean Cuisine Market Creations Mushroom Tortelloni | The Food Hussy! Lean Cuisine has these new Market Creations that come in a bag and steam in the microwave. I decided to try one since they were on sale. 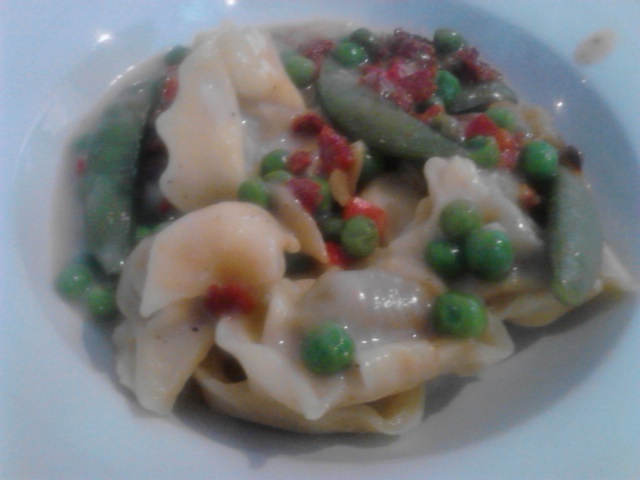 I went for the Mushroom Tortelloni. I had pretty high expectations I must admit. I wasn't even sure when I got to work how it would cook - I hadn't thought that far ahead. But the whole bag is the steamer - so you just pop it in the microwave. The one negative I see in this is that you need a bowl or something to put it in once it's cooked. I'm not one of those people that takes frozen meals out of their tray and plates them...but in this instance you don't have a choice. And here's the after in one of our pretty bowls at work. Flavor - it's creamy but not cheesy - something I always find a disappointment but I need to expect. There was way too much black pepper. There were a lot of veggies and they tasted good - so that was a plus. Pasta - it was okay - a little gummy and I didn't get a lot of mushroom flavor. Cost - Lean Cuisines were 5 for $11 I think. Fullness Factor - not good - the portion size is small - you definitely need something on the side. And the verdict - thumbs down. The other down side is that there is no Delicious Rewards code on bagged products - so it doesn't count on their program. Small portion, too much black pepper and no rewards = not buying again.